In the period just prior to 2008, the commercial real estate sector was riding a wave of unbridled optimism. That positivity was fueled by unprecedented price growth and confidence that values were only headed in one direction: upward. Enter the Great Recession, following the collapse of Lehman Brothers in the fall of 2008. Suddenly the market was witness to one of the sharpest falls in asset prices in recent memory: a plunge of more than 40%. Nearly 10 years removed from the fall of Lehman Brothers, the commercial real estate market has come back roaring. So what’s so different about today’s market compared to a decade ago? What forces are driving the market in new directions? Consider that since 2008, the industry has witnessed unprecedented federal monetary policy intervention. It has experienced a generational shift that altered the course of several economic sectors. And it has even returned to a landscape where monetary policy holds greater sway over cap rates than investment instruments. The prior cycle was mainly driven by Wall Street’s insatiable demand for commercial mortgage-backed securities, which in turn influenced compression of cap rates for all major asset types. The current compression of cap rates has been tied more closely to interest rate policy. 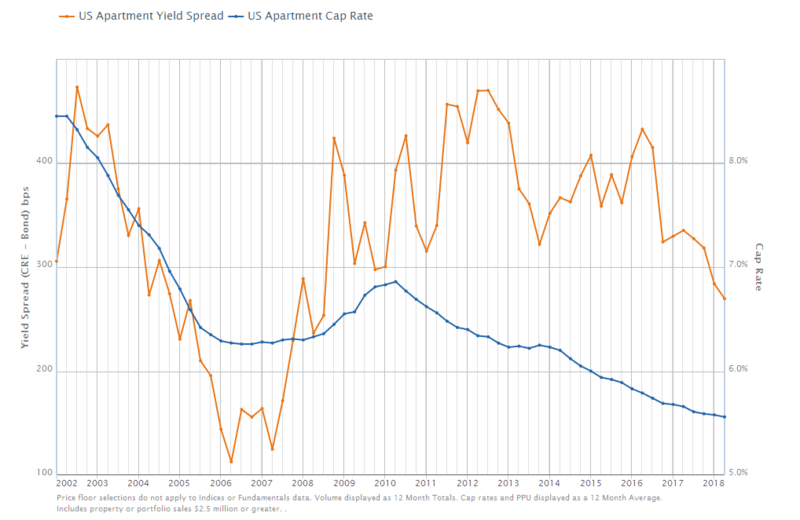 For a clearer example, we can examine the spread between the 10-year treasury and the average cap rate of multifamily properties in 2006. During the second quarter of 2006, the U.S. apartment yield spread compressed to its lowest level in recent memory: 113 basis points. With such a narrow risk premium, it’s logical to conclude cap rates at that time must have been influenced heavily by factors other than the 10-year treasury rate. One of those factors was Wall Street investors snatching up commercial mortgage-backed securities faster than banks could package them. In turn, lenders were all too happy to lend capriciously to CRE investors during this cycle, a trend that drove property values up and cap rates down. Comparatively, we’ve returned to a landscape where monetary policy is the ultimate influencer of cap rates. Through the second quarter of 2018, the multifamily yield spread stands at 276 bps, which is much more in line with the historical average of 330 bps. While monetary policy has been key to helping push cap rates to some of their lowest levels on record, one of the largest influences responsible for the changing landscape of the industry has been Millennials. Yes, the generation best known for turning their backs on once-essential consumer products (ranging from napkins to bar soap) has gained more monetary influence than ever before. As a result, every sector of commercial real estate has adapted to accommodate their needs. Multifamily: With the exception of urban centers like New York and Chicago, multifamily development in the previous cycle was mainly focused on Class “A” garden-style communities in the suburbs, where land was abundant and cheap. But with Millennial renters came heightened demand for urban living with walkable amenities. Developers shifted their focus in response, targeting in-fill lots and mid- and high-rise mixed-use communities more than ever before. The renaissance of Downtown and Midtown Detroit, where major employers now compete to attract Millennial talent, is one of the brightest examples of this trend. Office: As Millennials began to cluster in urban areas, so too did office developers and investors. This is evident when analyzing and comparing urban-core and high-density, mixed-use “surban” office space against the suburban office space common in the current cycle. At the peak, urban core office cap rates climbed to 8.1% in the first quarter of 2010. 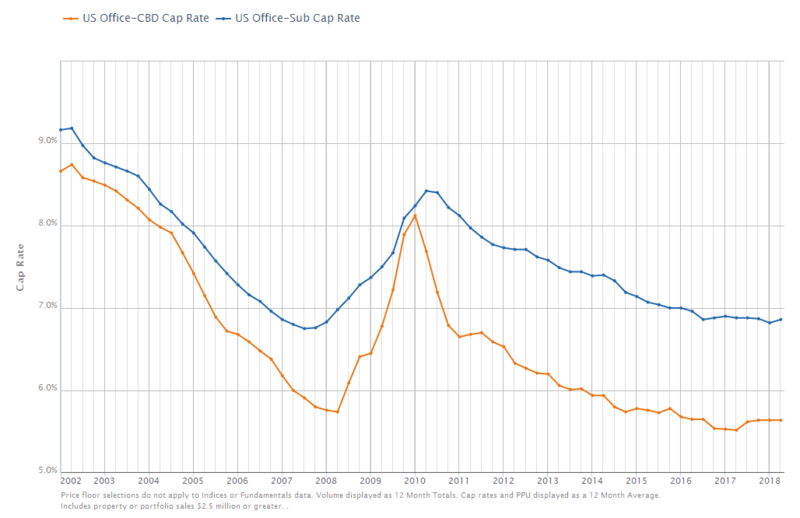 Since then, urban core office cap rates have fallen 250 basis points to 5.6%. Conversely, the suburban office sector witnessed only a 150-basis point contraction to 6.9% in the second quarter of 2018. Despite an excess of suburban office space, employers have been following Millennials to urban and surban locations, encouraging investors to concentrate investment in these areas. Retail: Many factors have played into the fall of certain subsectors of retail, ranging from e-commerce to stagnant middle-class income growth. But Millennials have exacerbated the process. As the generation that grew up on the internet and embraced smart phones from an early age, they expect their needs to be met in real time. As a result, Millennials more than any other generation are attracted to and willing to experiment with non-traditional retail, especially e-commerce. Traditional retailers have since embraced concepts like self-service lockers and door-to-door delivery to compete with the functionality of Amazon and the next generation of dedicated online retailers. Industrial: Driven to compete directly with the robust infrastructure built up by the nation’s top online retailers, small and enterprise-level businesses have invested heavily in “last mile” infrastructure since the end of the previous cycle. Additionally, investments in the industrial sector increased across the board as retailers of all sizes have sought to streamline and enhance their supply chain operations. During the past three quarters, cap rates for the industrial sector fell below retail and office sectors for the first time following the recession, equaling 6.4% through the second quarter of 2018. This trend reflects the growing value of industrial assets caused by shifting spending habits driven by Millennials. This overview emphasizes how key sectors in commercial real estate have changed dramatically at a national level since the previous cycle. In large part, this was the result of the growing influence and spending power of Millennials. As we wrap up 2018, we’ll continue to analyze and discuss how these trends played out at the market level. Check back for our future blogs for a closer look at some of the metros that have enjoyed the biggest post-recession comebacks.